Delicious home-made soup in a jiffy! Sometimes cooking can become a bore as you limit yourself to the same old things day in day out, especially after a long working week cooking is the last thing you want to do. On those cold nights nothing is more satisfying than a hot bowl of hearty soup bursting with nutritional goodness! Now you can make your own healthy soup all from the comfort of your own home. Despite your cooking ability you can create your very own ready-to-serve delicious hot soup, jam packed with an abundance of vitamins and minerals – and the best part is that it will be ready in under 20 minutes. The soup maker boasts a locking safety lid to save you from any potential mishaps and accidents. The electric soup maker comes with a soup recipe guide so you can create your own ready-to-serve soup! From many different choices and combinations the possibilities are endless and meal times never have to be boring again! 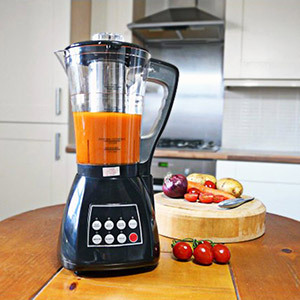 With the simple touch of a button you can make the soup or drink of your preference including thick, chunky or smooth. You will always know what you are eating and what’s going into your food so no more paying a fortune for some pre-prepared, processed alternative from the shops. The soup maker is easy to clean with no knives needed so your time spend in the kitchen will be much less. All you need to do is add your favourite ingredients and stock, and let the soup blender do all the work for you; chop, simmer and blend until perfection is achieved! For Coffee - Want a great cup of coffee in the morning? Then use your soup maker to grind and heat your favourite coffee! It will fast become your new favourite kitchen utensil! Reheat, boil & steam – Reheat soup or coffee which you have previously made or allow your mixture to boil and steam! Make beautiful and delicious soup with minimal effort using the Good Ideas Soup Maker. Perfect to provide yummy meals that the whole family will love, convenient, fast and nutritious you simply can’t go wrong.